Matt Brubaker (left) and Kris Bertness with the chamber in which nanowires are formed. One of the persistent challenges in 21st century metrology is the need to measure ever-more-detailed properties of ever-smaller things, from microchip features to subcomponents of biological cells. That’s why, four years ago, a team of NIST scientists patented the design for a nanoscale probe system that can simultaneously measure the shape, electrical characteristics, and optical response of sample regions a few tens of nanometers (nm, billionths of a meter) wide. 100 nm is about one-thousandth the width of a human hair. Now the researchers from NIST’s Physical Measurement Laboratory are closing in on a working prototype. The newest version of the device, which has a probe tip that functions as an ultra-tiny LED “spotlight,” holds great promise for identifying cancer-prone tissue, testing materials for improved solar cells, and providing a new way to put circuits on microchips, among other uses. The Integrated Near-Field Optoelectronic (INFO) system has the general configuration of an atomic force microscope (AFM), in which a probe tip on the end of a tiny cantilever beam passes a few nanometers over the surface of a sample, recording exact details of its morphology. But the metal-plated INFO probe also serves as a transmitter that projects microwaves into the sample as well as a receiving antenna that detects the altered microwaves coming back out. The nature of that alteration reveals electrical and chemical properties of the material. The system uses gallium nitride (GaN) nanowires as the basis of the nanoprobe. “In addition to being a semiconductor, gallium nitride is mechanically very strong,” says group leader Kris Bertness. “It’s a ceramic, kind of like a high-performance kitchen knife. It’s tough as nails.” As a result, the probe – a few hundred nanometers wide at the point and about 4 micrometers (millionths of a meter) long – doesn’t lose its sharpness, which is critical to performance. But GaN has another major advantage: It is the material widely used in light-emitting diodes (LEDs). So, in addition to serving as an AFM and microwave transmitter/receiver, the probe tip also functions as a light source for measuring how a sample responds to illumination. 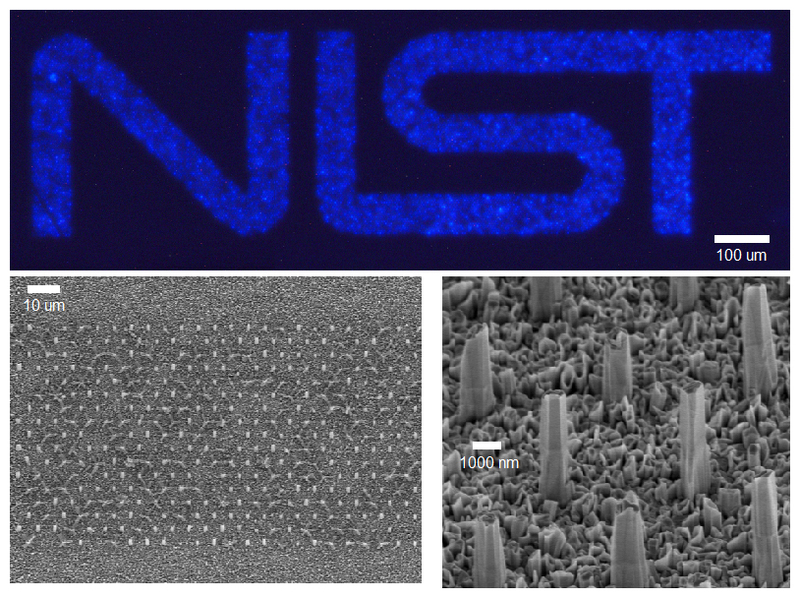 This image shows the NIST logo made from glowing nanowire LEDs. While the color of the nanowires in the image looks blue, they are actually emitting in the ultraviolet with a wavelength of approximately 380 nm. The other two images, from a scanning electron microscope, show the overall structure of the nanowires. Recently, the team found a way to increase the light output of their probe 100-fold by experimenting with the placement and configuration of “n-type” silicon-doped GaN (which has an excess of free electrons) and “p-type” magnesium-doped GaN, which has a surplus of “holes” – areas where electrons are missing. When an electron and hole combine, they release energy in the form of light, as in LEDs. (See illustration.) Conversely, when light strikes the material in a solar cell, its absorbed energy separates electrons and holes, prompting a current to flow. Integrated circuit fabricators could use INFO to look for defects and identify the exact location of specific dopant areas in ultra-small features. “The channels are now getting so small, about 15 nm or smaller, that where the dopant atoms actually sit matters,” Bertness says. “Nobody used to have to care about that, but now they might be able to sense those locations because you could optically excite the carriers in and out of the dopant atoms and sense the change with the microwave reflection. Increasing the LED light output from the probe required a prolonged research effort involving the development of several key capabilities. One of the most difficult problems was developing selective-area nanowire growth, which is a process through which nanowire growth can be prescribed at specified locations. Identification and control over the crystal polarity that develops as the GaN wires grow was found to be critical in developing this capability. Another was determining the right geometry and formation conditions for the p-type section of the probe.